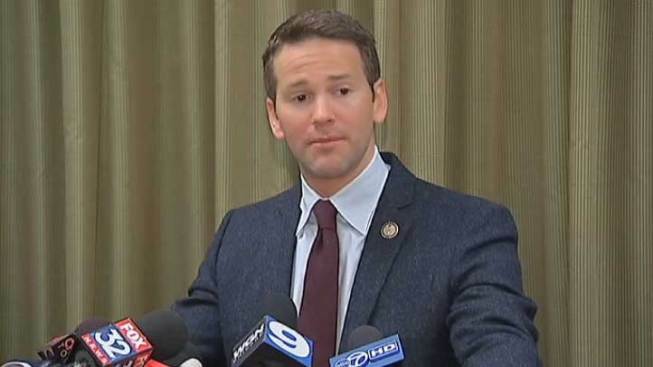 Rep. Aaron Schock returned to the House floor Wednesday for the first time since resigning from Congress over a year ago, according to the Chicago Sun-Times. Shock was in attendance Wednesday to hear India Prime Minister Narenda Modi address a joint session of Congress. “Yes, here for my friend Narenda Modi,” Schock told the Sun-Times. The former congressman, who was particularly involved in India issues during his time in the House, shook Modi’s hand as he entered the chamber. Schock announced his resignation from the House in March of last year following questions surrounding misuse of funds in his campaign and congressional spending accounts, including reports that he redecorated his office with lavish decor inspired by "Downton Abbey." A Springfield grand jury has been hearing testimony related to spending from Schock’s office allowance and political funds for the past year.